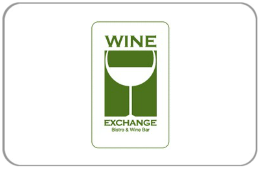 The Wine Exchange Bistro & Wine Bar in Hyde Park Village has been dishing out great food and exceptional wines since 1990. With a reverential nod to the street side cafes of Europe, the Wine Exchange offers a welcoming and relaxing respite from the everyday toil. Taste wines from all over the globe in our crystal stemware, while sitting on the patio, or take in the surrounding scenery sipping martinis at our fully stocked bar. With over forty different wines by the glass and a bartending crew that really knows how to shake it, you are sure to find an old favorite or discover something new. Whether you're on your own and just need a place with free Wi-Fi, or you're getting together with long lost friends, we have a selection of 1/2 bottles and gems galore to make your experience memorable.